A man arrested but never charged in connection with an investigation into child sexual grooming has lost a legal battle to keep his identity secret. Tariq Khuja attempted to use privacy laws to stop press and media reports after he was named at the high profile 2013 trial of nine men from Oxford. The Supreme Court stressed Mr Khuja was an innocent man but ruled he had no "reasonable expectation of privacy" under human rights legislation. The judges lifted an anonymity order. Seven men were convicted and jailed at the Old Bailey in May 2013 for serious sexual offences in connection with what became known as the "Oxford grooming case". The Supreme Court ruling, by a 5-2 majority, stemmed from an attempt by the Times and the Oxford Mail newspapers to name Mr Khuja. BBC legal correspondent Clive Coleman described the court's decision as significant, saying it reaffirmed the powerful principle of open justice. The case examined the rights of the press and public under Article 10 of the European Convention on Human Rights to freedom of expression and the rights of Mr Khuja and his family under Article 8. Described as a "prominent figure in the Oxford Area" Mr Khuja had been arrested in March 2012 after one of the complainants told police she had been abused by a man with his first name. She failed to pick him out at an identity parade and he was released. Orders imposed during the magistrates and crown court proceedings prevented Mr Khuja's name from being published to prevent reports potentially prejudicing a future trial. He was subsequently told he would be released without charge, although his case would be kept under review. The newspapers applied to lift the anonymity order on the basis there were no pending or imminent proceedings. But Mr Khuja applied to the High Court for a privacy injunction to stop publication on the basis it was needed to protect his private and family life. The court rejected the application and the Court of Appeal dismissed his appeal. 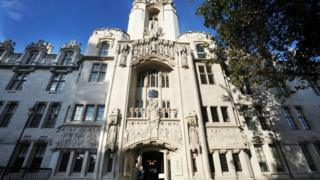 Giving the Supreme Court's judgment, Lord Sumption said the case related to matters discussed at a public trial and the public interest in allowing press reporting of court proceedings extended to Mr Khuja's identity. "The impact on his family life was indirect and incidental. Neither he nor his family participated in any capacity at the trial, and nothing that was said at the trial related to his family," he said.